RUSH: The Official Program Observer, Mr. Bo Snerdley, with a question. What’s the question? (interruption) Mmm-hmm. The question from the Official Program Observer is if I were Mueller…? You mean Mueller, the…? (interruption) Yeah. If I were Mueller and I’m looking at all this today, would I be aghast, would I be angry, would I be ticked off, would I be mad at Michelle what’s her name for the White House Correspondents…? Would I be wanting to correct the record here? (interruption) Nope! Nope. If I’m Mueller, I don’t care what’s in the public. If I’m Mueller, the more confusion about what I’m doing, the better. If I’m Mueller, the more mystery, the more confusion and the more frustration about what I’m doing, the better. If I’m Mueller, I don’t give a rat’s rear end about public opinion. If I cared about public opinion, I wouldn’t be doing any of this. If I’m Mueller, I don’t care about public opinion. Public opinion is why I’m here. I think public opinion’s full of it. They elected Trump! I’m here in spite of public opinion. Why would I, Robert Mueller, care about public opinion? I am a lawyer. I’m a special counsel. The people with their opinions have no idea what I’m doing. They can’t possibly understand what I do. Even if I told them, they’re not smart enough to know what I’m doing, so I don’t care what they think. Mueller couldn’t care less. It’s gonna… You know what? Because of the question from the Official Program Observer, I need to go back. Grab audio sound bite No. 1. Let me remind you what this is all about. RUSH ARCHIVE: Donald Trump must be destroyed simply because he’s there. Donald Trump has to be taken out. He has to be destroyed and ruined politically and, if they can, financially. Make no mistake that that’s an objective too. You can read between the lines of the latest leaks of the highly respected and immensely respected Robert Mueller, the independent counsel. He’s going after Trump’s money, going after Jared Kushner. They are not going to leave one stone unturned in their effort to demolish, to ruin, to destroy Donald Trump. They want to obliterate the star. They want to create a figure of great shame and embarrassment, and they want to take away from him all of his achievements, including his money. RUSH ARCHIVE: The Mueller gang is not gonna quit until they find something that they can nail Trump with. I am reliably told that Mueller has not given up on the whole collusion angle. The conventional wisdom is that there isn’t any evidence that Trump colluded with Russia. And so Mueller has moved on now to trying to prove obstruction of justice, that Trump has stood in the way of justice being done in the United States. But the intel that I have from deep state sources tells me that Mueller has not given up the collusion angle, that Mueller’s not given up any angle. 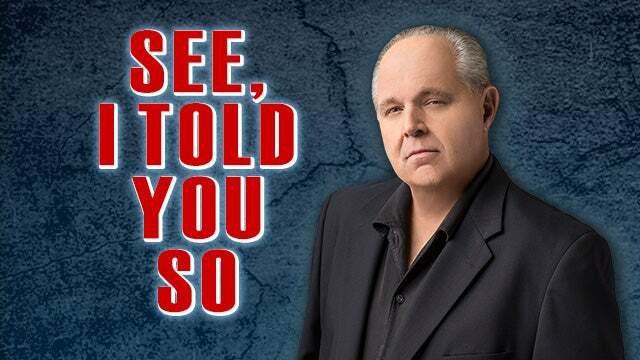 RUSH: So you want to ask me again if I’m Mueller and I see all this stuff out there that is so wrong and so out of context, I might want to correct the record? You think? Has Mueller said anything since this began? I mean, he’s gone up there. I guess he’s answered a couple questions before some committees. But it was insignificant. Mueller hasn’t said anything, his legal team hasn’t said anything. His spokesman said a few things, and nobody can remember what they are. He doesn’t care. “Independent! Special! I’m better than you; I’m different than you. “I have integrity; you don’t. I have a great reputation; you don’t.” By the way, does anybody remember that Obama said he knew the Russians were colluding? Does anybody remember this? Trump did not collude. There isn’t any evidence for it. And yet Mueller wants to question Trump. Obama told us all that he knew of Russian election corruption. He told Putin to “cut it out,” remember? He told Putin to “cut it out,” and that was supposed to scare Putin so badly that Putin would stop doing it. Obama had intelligence reports that the Russians were colluding. Obama went public and said it would not be possible for an outside actor or player to sway a presidential election. By the way, Obama was right about this. Our elections are way too complex. You wouldn’t know what to tamper with. You couldn’t tamper with all of it. Nobody could. Even… I mean, no one political party could tamper with every aspect of a federal presidential election. Russia, the ChiComs, they couldn’t, and Obama was dead right on when he said there’s too much that you don’t know that you would have to try to fix, but you can’t do it anyway. You’d have to know which states are up for grabs Electoral College-wise. We have too many precincts, too many polling places, too many different ways from state to state that elections are conducted. It would be impossible. Obama said all of this, folks! Cookie, go get me the sound bites. We’ve played them. They’re in our archive. They range from 2015 all the way through 2016. Obama said he knew of collusion. Obama said it would be impossible. He was trying to assure everybody. After telling us that the Russians were tampering and trying to, he assured us it couldn’t happen. Well, okay, then why is all of this happening, then? Obama had intelligence reports the Russians tampered. He stood down. We know that Obama’s FBI many of you led or conspired with at least one FISA judge. We know that Obama’s DOJ was thoroughly politicized. We know that they were working overtime to prevent Trump from winning — and then after he won, doing everything they could to smear him. We know that Comey as a leaker and a liar. We know that Trump is a victim of so much of this. And Mueller is now down to the looking for process crimes with these questions for Trump. The wrong people are being queried here. If you want to make real news, somebody leak that Mueller has questions for Hillary, that Mueller has questions for Christopher Steele, that Mueller has questions for Glenn Simpson of Fusion GPS. Somebody leak that Mueller has questions for Obama! Somebody leak that Mueller has questions for Comey and McCabe, because these are the people who need to be answering questions, not Donald Trump. Again, folks, all of this is happening because of a fake dossier. Every bit of this! I don’t care. Every question that’s leaked in this news story today the New York Times that Mueller supposedly wants answers to, all of this… This is what frosts me to the point that I start losing my temper over this. All of this is based on something that is fraudulent and phony: The Steele dossier. Every bit of this which is disrupting our country, which is ruining people’s lives… When I say “ruining,” it has the potential to do great damage. Look at what these people are doing to the public perceptions of our presidential elections. And they all know it’s a lie! They all know it’s bogus. They all know that Russia could not have determined the winner of the presidential election. They could not have. Obama himself said so, and yet what are we doing? We’ve got this endless investigation on the premise that Trump did indeed cheat with the Russians, and that’s never been established. It can’t be established because it didn’t happen, the place it’s alleged, the Steele dossier is fiction. It’s made up. It’s mind-boggling what is happening here! And the introduction of these questions into the public domain today, they don’t help. I don’t care what your interpretation of them is, they do not help because ultimately what they do is sustain the idea that somebody cheated here, that this election was not legitimate and that somebody has the answers to it. And since it didn’t happen, nobody has those answers. And yet we continue to pursue it? Why? Take you back to audio sound bite No. 1. Donald Trump must be destroyed simply because he’s there. Donald Trump has to be taken out, removed. He has to be ruined politically. All because he won. Not because he cheated, but because he won. Looked at another way, because Hillary lost. The irony is these people thought they were the ones that had wired the election. When you get right down to brass tacks, these are the people that thought they had Hillary guaranteed to win. They thought they had done everything necessary. In fact, they looked at Trump winning the nomination as the exclamation point on their landslide. Trump getting the nomination Republican side was the best news they had had. No way could Trump win. Trump was gonna get 20% of the vote. He was gonna take the Republican Party down the tubes with him. It was gonna be the end of any opposition! Hillary was gonna win. The fix was in as far as they’re concerned. And everything they planned for, every step they took to ensure a Hillary Clinton outcome blew up in their faces. And this must not be permitted. This is not allowed! So everything that’s happened since election night has been to reverse that, and virtually everything being investigated, somebody did it — or tried — and it’s all on the Democrat side, starting with Obama, who told us he knew the Russians were colluding, who told us it was impossible to the Russians to actually determine the outcome of a presidential election. Quick time-out. We’ll be back. Does that answer your question, Mr. Snerdley? (interruption) Good. Okay.